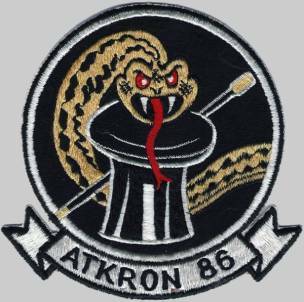 Strike Fighter Squadron EIGHT SIX traces its origins to Fighter Squadron 921, based at Naval Air Station St. Louis, Missouri, during the Korean War in February 1951. In February 1953, the squadron was re-designated VF-84 while deployed to Guantanamo Bay, Cuba, aboard USS ANTIETAM (CV 36). In July 1955, the squadron was re-designated VA-86 Sidewinders. From 1955 to 1987, Sidewinders flew the F4-U "Corsair," F8F-2 "Bearcat," F9F-5 "Panther," F7U-3M "Cutlass," also known as the "Ensign Eater," A4D-1 "Skyhawk" and A-7A/C/E "Corsair." During these transitions, Sidewinders made numerous deployments to the Mediterranean and Caribbean Seas. The North Atlantic, the Western Pacific and the Indian Oceans in various aircraft carriers, including USS ANTIETAM (CV 36), USS BENNINGTON (CV 20), USS LAKE CHAMPLAIN (CV 39), USS FORRESTAL (CV 59), USS RANDOLPH (CV 15), USS INDEPENDENCE (CV 62), USS INTREPID (CV 11), USS LEXINGTON (CV 16), USS AMERICA (CV 66), USS CORAL SEA (CV 43) and USS NIMITZ (CVN 68). In September 1969, Sidewinders made an emergency sortie aboard AMERICA for a ten month combat deployment to Southeast Asia. The Squadron was once again on "Yankee Station" in the Tonkin Gulf when the Paris Peace Accords were signed and our Prisoners of War finally returned home. This was the squadron’s fourth combat deployment to Southeast Asia, more then any other East Coast attack squadron, During that deployment, Sidewinders participated in the most intense air combat encountered throughout their extensive Southeast Asian involvement, earning the Meritorious Unit Commendation. Throughout the 1970s and 80s, as part of the NIMITZ team, Sidewinders made numerous deployments to the Mediterranean and North Atlantic. Sidewinders were awarded the 1982 COMNAVAIRLANT Battle "E", denoting the best A-7E squadron on the East Coast. Sidewinders were awarded the 1985 Admiral Wade McClusky Award, signifying the best attack squadron in the Navy. In June of 1987, after a cameo appearance in the Hollywood film Final Countdown, Sidewinders departed NIMITZ and transitioned to the FA-18C Hornet, re-designated Strike Fighter Squadron (VFA-86). Reserve Fighter Squadron 921 (VF-921) was called to active duty from NAS St. Louis on 1 February 1951 for the Korean War flying the F4U-4 Corsair. VF-921 was assigned to Carrier Air Wing Eight and deployed to the Mediterreanean Sea aboard USS Tarawa (CV-40), in 1951-52. 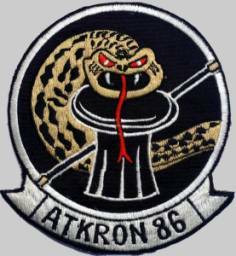 On 4 February 1953, the squadron was redesignated Fighter Squadron 84 (VF-84), while deployed to Naval Station Guantanamo Bay, Cuba aboard USS Antietam (CVA-36). In June 1953, the squadron briefly flew the F8F-2 Bearcat in preparation for transition to the F9F-5 Panther in November 1953. 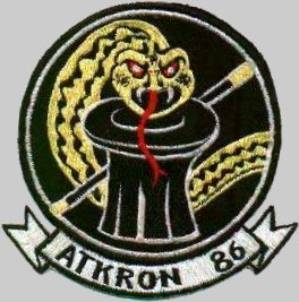 The squadron's current "Sidewinder" name and insignia were adopted in April 1954. Flying the Panther, VF-84 was again deployed to the Mediterranean Sea aboard USS Lake Champlain (CVA-39) from September 1954 to April 1955. 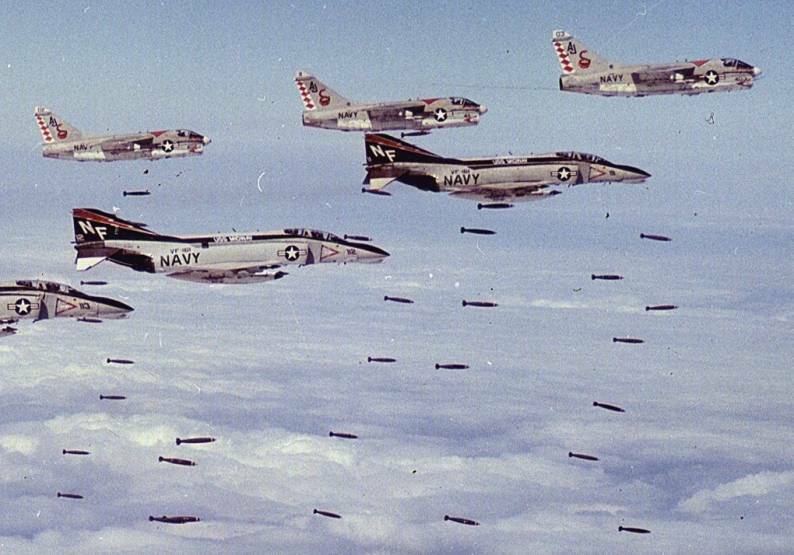 On 1 July 1955 the squadron began flying the F7U-3M Cutlass, was redesignated Attack Squadron 86 (VA-86), and conducted extensive evaluation of the AIM-7 Sparrow missile. VA-86 was deployed with the F7U only for the shakedown cruise of USS Forrestal (CVA-59), being assigned to Air Task Group 181. 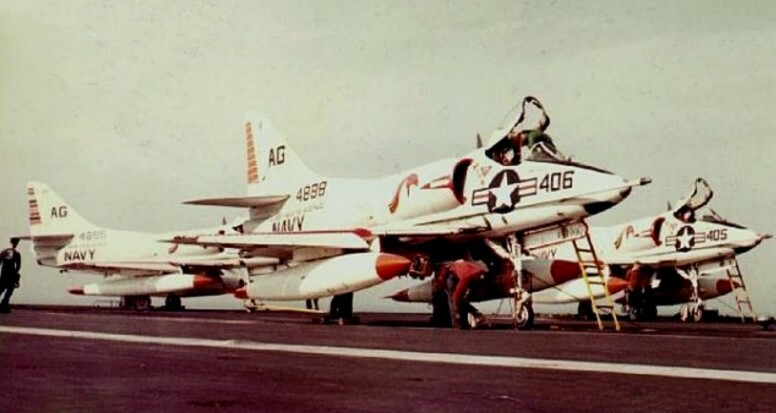 From May 1957 until 1967, the squadron was assigned to Carrier Air Wing Seven, being equipped with various marks of the Douglas A4D/A-4 Skyhawk. Between September 1958 and March 1958, VA-86 was deployed aboard USS Randolph (CVA-15), before CVW-7 was reassigned to the recently commissioned USS Independence (CVA-62). In April 1961 VA-86 operated from USS Independence near Guantanamo Bay, Cuba, during the Bay of Pigs Invasion. 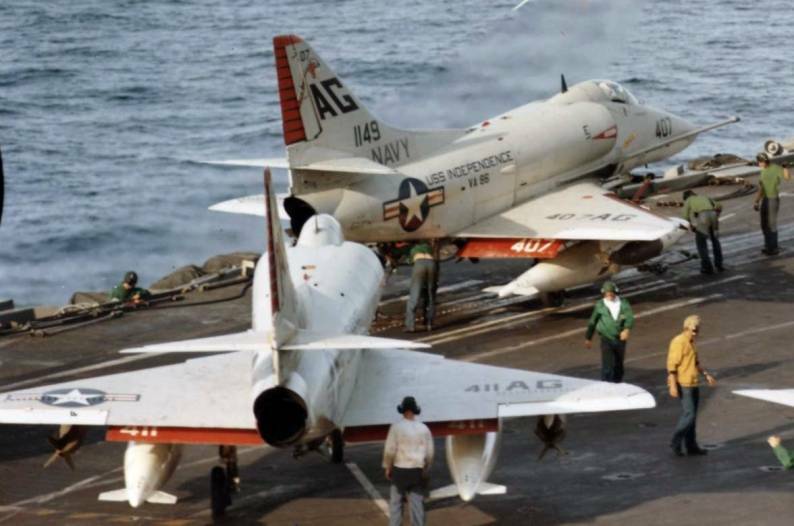 In November 1962, the squadron was assigned to Carrier Air Wing Three and embarked in USS Lexington (CVA-16) during the Cuban Missile Crisis operating off the coast of Jacksonville, Florida. VA-86 was flying a mix of A-4Bs and A-4Cs, as the squadron was transitioning to the A-4C. In April–May 1963, VA-86 provided A-4C detachments aboard Atlantic Fleet anti-submarine carriers USS Essex (CVS-9), USS Randolph (CVS-15), and USS Wasp (CVS-18). The aircraft were equipped with AIM-9 Sidewinder missiles to provide the carriers with anti-air warfare capability. 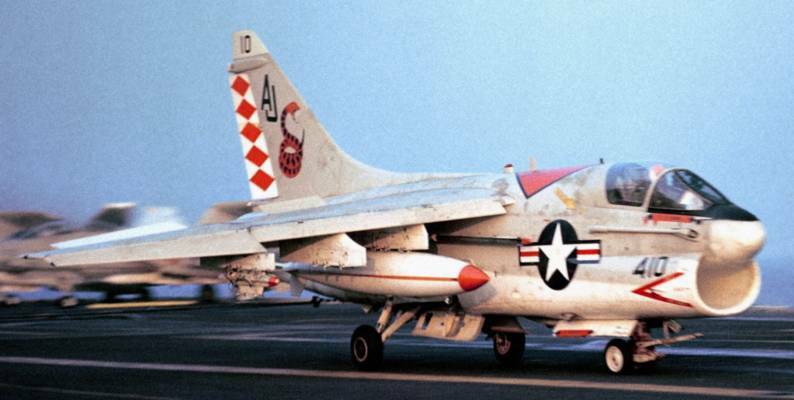 From August 1963 to March 1964, VA-86 was again deployed with CVW-7 aboard USS Independence to the Mediterranean Sea. Following this deployment, the squadron transitioned to the A-4E. On 1 July 1965, the squadron conducted its first combat missions, flying from Independence against targets in South Vietnam. In 1966-67, VA-86 was back in the Mediterranean Sea aboard Independence. 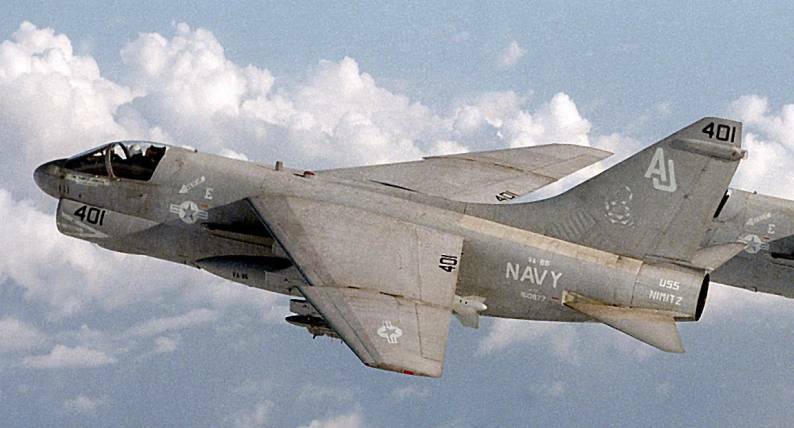 On 1 June 1967, VA-86 became the Navy's first operational Atlantic Fleet squadron to fly the A-7A Corsair II. VA-86 was reassigned to Carrier Air Wing Six and made another deployment to Vietnam aboard USS America (CVA-66). The squadron conducted its third South East Asia combat deployment aboard USS Coral Sea (CVA-43) from September 1969 to July 1970 while being assigned to Carrier Air Wing Fifteen. 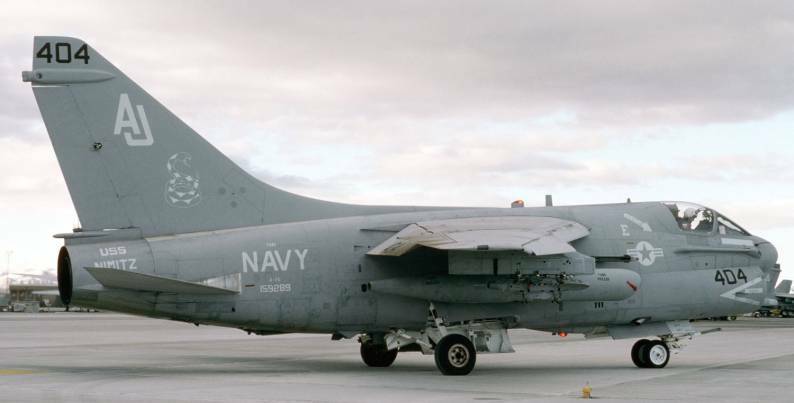 VA-86 transitioned to the A-7E after the 1969/70 cruise aboard USS Coral Sea (CVA-43). From 1971 to 1987, VA-86 was again assigned to CVW-8. In late spring of 1972, VA-86 was forced to transition to the A-7C due to unexpected problems with the A-7E's TF-41 engines. The Sidewinders then deployed from June 1972 to March 1973 aboard USS America for a ten-month combat cruise, participating in several intense and lengthy bombing campaigns, including Operation Linebacker and Linebacker II in late-1972. The squadron remained on station until the Paris Peace Accord was signed in late January 1973. This was the squadron’s fourth combat deployment to Southeast Asia, more than any other East Coast attack squadron and resulted in the receipt of the Meritorious Unit Commendation. The squadron transitioned to the A-7E in 1974 and was aboard America for 7 months duty. In 1975, Sidewinders went aboard USS Nimitz (CVN-68) for the ship's maiden voyage and made further deployments during the late 1970s and 1980s. In 1979, VA-86 planes appeared in the movie The Final Countdown, which was in filmed aboard USS Nimitz at at Naval Air Station Key West, Florida. In January 1980, after the seizure of the American Embassy in Tehran, Iran VA-86 departed Naples, Italy embarked in Nimitz, en route to the Indian Ocean via the Cape of Good Hope, beginning of 144 consecutive days at sea. In 1981 while aboard Nimitz, the squadron participated in a Freedom of Navigation Exercise in the Gulf of Sidra incident. During this tense period, VA-86 flew Aerial refuelling and reconnaissance missions over potentially hostile Libyan ships. The Sidewinders were awarded the 1982 COMNAVAIRLANT Battle "E", as the best East Coast A-7 squadron. In Jun- July 1985 while aboard Nimitz, VA-86 operated off the coast of Lebanon due to the hijacking of TWA flight 847 by Arab radicals, and later that year the Sidewinders were awarded the Admiral Wade McClusky Award, signifying the best attack squadron in the Navy. January–February 1987 while embarked in Nimitz, VA-86 operated off the coast of Lebanon after three U.S. citizens were taken hostage from the American University in Beirut. On July 15, 1987, VA-86 was officially redesignated Strike Fighter Squadron 86 (VFA-86), and began flying the F/A-18C Hornet.